Tag Archive | "Jeff Slancik"
Cut netting: A seine pulled tight to shore that contains minnows for sorting and harvesting. 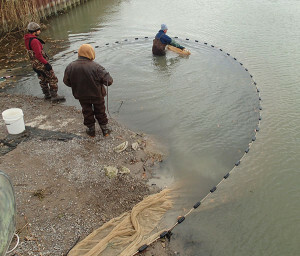 The net had been positioned in a cut off Saginaw Bay. Falling water temperatures can mean a lot of things to those who enjoy the outdoors. Cold water increases interest in steelhead fishing, for instance, and decreases the focus on bass fishing. However, to Jeff Slancik of Bay County, cold water means just one thing: It’s time to catch minnows. Slancik, 49, of Pinconning is a bait dealer whose business heats up when the weather cools down. Slancik has operated Jeff’s Bait Co. in Pinconning for 25 years. He’s one of a number of Michigan commercial bait wholesalers who catch minnows and sell them to distributors, who then get them to the bait shops anglers depend upon. Picking: A worker inspects the contents of a dip net, picking out nontarget minnow species as the crew works a cut off Lake Huron in Michigan’s thumb area. Minnow harvesters are licensed by the Michigan Department of Natural Resources. 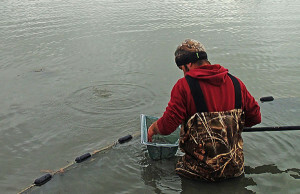 Tom Goniea, the DNR fisheries biologist who oversees the program from Lansing, said there are about 80 licensed minnow catchers in Michigan, but only a handful of large operators like Slancik. Minnows: A perch is removed from a dip net full of minnows taken from a cut off Saginaw Bay. Minnow harvesters are restricted to the types and size of gear they can use. For Slancik, a recent day began on a cut (a nonflowing man-made channel connected to a larger body of water which aids in getting boats access to open water) along Saginaw Bay not far from home. Two of Slancik’s employees manned the ends of a seine stretched across the cut, one on the bank, the other in a float tube along the edge of the deeper side of the cut. Slowly, they pulled the seine toward the inside end of the cut, where Slancik directed them. When they reached a point a couple yards off the back end of the cut, Slancik sprang into action, bringing dip nets and a larger floating pen net with him. The trio began scooping up minnows, weeding through them to toss out the non-minnow captives, mostly perch, and transferring the minnows into the net pen. The fish were then filtered through a grader— a floating device with a slotted bottom that allowed the smaller fish to slip through to the pen, but contained the larger fish. 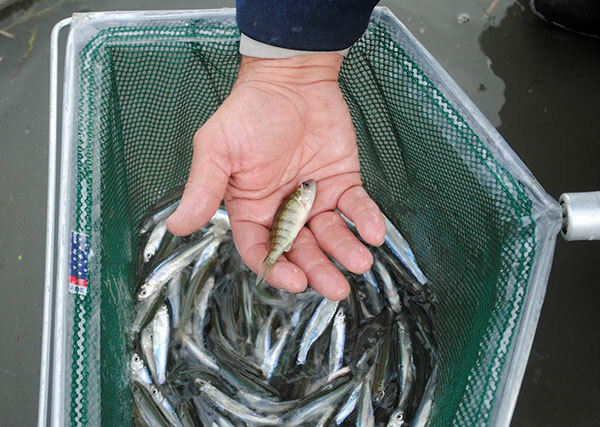 From there, they again dipped the minnows up with hand nets and sorted, tossing out perch or other non-target species, transferring the minnows into 5-gallon buckets. Slancik took a bucket to his truck, which is equipped with numerous, oxygenated tanks. There, he sorted one more time, removing any non-minnow fish before he transferred the minnows to the truck tank. Slancik said sorting takes a lot of time. Had they found many more perch or other unwanted specimens in the seine, he said he would have dumped the whole load back into the cut and gone elsewhere. Slancik works a territory from Pinconning north and east along the thumb of the state to Port Austin in Huron County. More than half the minnows he takes are used in the local Saginaw Bay area. In a cold winter, with good ice, 75 percent of his minnows are sold locally. “From November first to December, it’s go, go, go, sometimes 24 hours a day for five days straight,” Slancik said. “On a good day, we’ll get 300 gallons of minnows, about 700 per gallon.” Minnows are sold by the gallon commercially in Michigan. In some others states, they’re sold by the pound. Like most fishing pursuits, Slancik’s minnow catching luck runs hot and cold. Slancik said he puts between 7 million and 10 million minnows in ponds, which he keeps aerated, for the winter season. State law prohibits minnows caught in Michigan to be exported out of state. “Any minnow that is harvested in Michigan is meant to meet the local demand of Michigan anglers, without disturbing the food chain for our predator fishes such as trout, walleye and smallmouth bass,” Goniea said. Goniea said minnow harvesters are not doing any damage to the fisheries resource. This fall, Slancik has mostly caught emerald shiners, the minnows anglers call “blues.” Spottail shiners, known as “grays,” were down a little. Slancik said there are more baitfish in Lake Huron now than ever. Slancik said he’s seeing more gizzard shad and alewives lately, too. The DNR monitors the minnow harvest to make sure invasive species and those that can carry diseases — such as viral hemorrhagic septicemia (VHS) — aren’t spread. In the summer months, when minnows can’t be kept in ponds, a lot of minnows are imported. But in winter, if you’re seeking a Pure Michigan experience—say walleye fishing through the ice–you’re likely using minnows caught right here in Michigan, by commercial bait harvesters like Slancik. For more information on Michigan minnows, visit the DNR’s webpage at www.michigan.gov/fishing.